Friday I leave for the Asheville airport, make a stop in Atlanta, then fly to Portland for three days at the Modern Quilt Guild SewDown in The Nines Hotel. BERNINA of America is a Modern Quilt Guild (MQG) sponsor and is providing all the sewing machines at the hotel for this event – thirty-five 350 PE and thirty-five 750 QE machines. 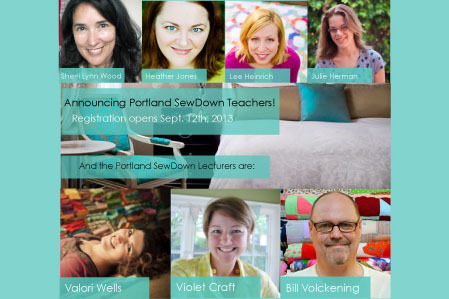 The hands-on classes include Improv Round Robin with Sherri Lynn Wood, Modern Strip Piecing with Heather Jones, a Modern Traditionalist Mini with Lee Heinrich, and Sidekick Sampler Workshop with Julie Herman; plus lectures with Violet Craft, Valori Wells, and Bill Volckening. I can’t wait! Some of you may be like me, with quilted projects you’ve haven’t finished or don’t use. 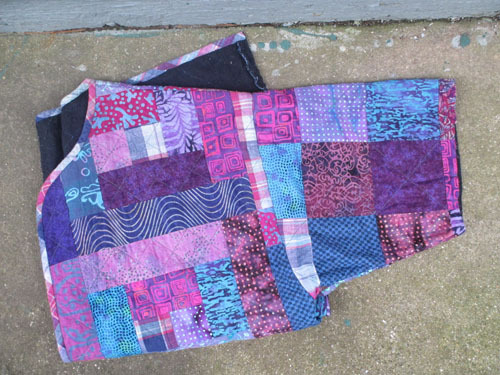 Years ago I made one of those cut-apart-a-sweatshirt, put-some-patchwork-on-top, quilt-it, then-piece-it-back- together jackets. 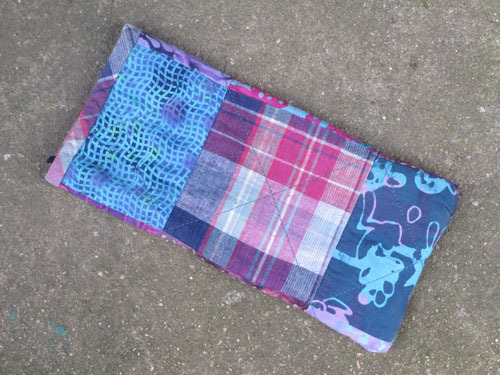 But I never wear it: I’ve lost weight and it’s much too big, but I love the patchwork and can’t bear to give it away. This was a perfect opportunity to recycle part of it into something I’d use and enjoy. I folded it in half, serged across the end and along the side, turned it right side out, and voila! A pretty little case for my flat-iron. 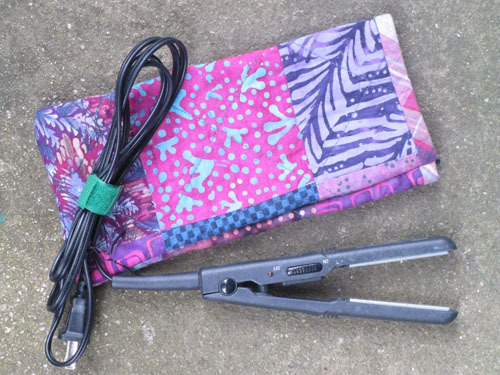 It’s not very insulated, so I don’t plan to use it for stowing a still-warm flat-iron, but it’s much better option than just tossing it in my suitcase. 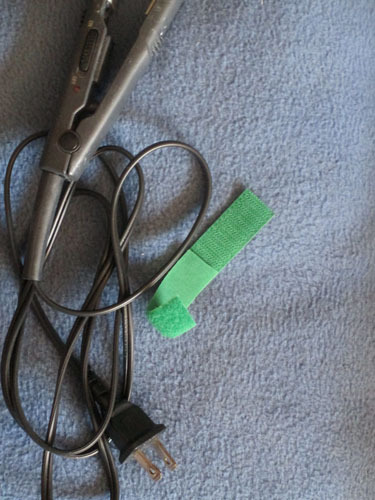 Tip: Curious about my green cord tamer? It’s just 2″ of hook-and-loop tape! Offset the hook tape from the loop tape about 1/2″, then wrap and fasten. 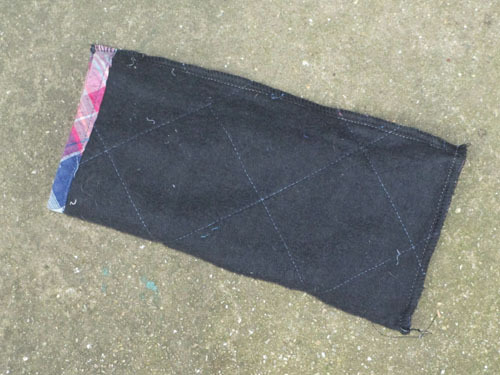 Send photos if you make an upcycled/rescued sleeve – I’d love to see what you recycle and what you turn it into!